As I mentioned in my previous post on climate and security, I went to Colorado College last week for two talks that Andrew Price-Smith organized. The second talk covered the theme of global climate governance (slides here). Last month, both Jennifer Hadden and I wrote about the People’s Climate March and the renewed optimism about possible international progress on climate change that accompanied the UN leaders meeting in New York. I wanted to expand on the theme, not simply because of the talk in Colorado. The strategy for next year’s climate negotiations has been in the news of late. Just last week, U.S. climate envoy Todd Stern laid out in a talk at Yale the potential U.S. strategy for next year’s 2015 Paris climate negotiations, emphasizing that only parts of the agreement should be legally binding. Elsewhere, UCSD’s David Victor argued that the 2 degrees Celsius target that negotiators previously embraced as the ceiling for warming is unrealistic and unworkable. Both are provocative and potentially helpful ideas. Here’s why. Climate change is perhaps the most difficult collective action problem the world has ever encountered. Addressing the problem requires a fundamental reorientation of modern energy systems away from fossil fuels, or, at the very least, innovations that are not yet commercially viable that would allow us to capture and sequester carbon. That is not an easy challenge, especially when these changes requires not only the actions of the major emitting countries but also private sector and individual-level behavior change. The collective action dilemmas of that many actors is daunting. Recent data from the Global Carbon Budget suggest that if the world wants to keep global temperatures from increasing on average more than 2 degrees Celsius, then the total concentration of greenhouse gases cannot exceed 3200 parts per million. At current rates of increase, they estimate we have only 30 years until the entire global carbon budget is entirely exhausted. That means we can’t waste the next seventeen years on diplomatic activity like we wasted the last ones. The United Nations Framework Convention on Climate Change (UNFCCC) negotiating process has not been conducive to effective action. The UNFCCC has been saddled with unanimity rules, and while universal participation has the virtue of involving all country stakeholders, including countries most likely affected by climate change in the developing world, this comes at a cost of reaching meaningful agreements. 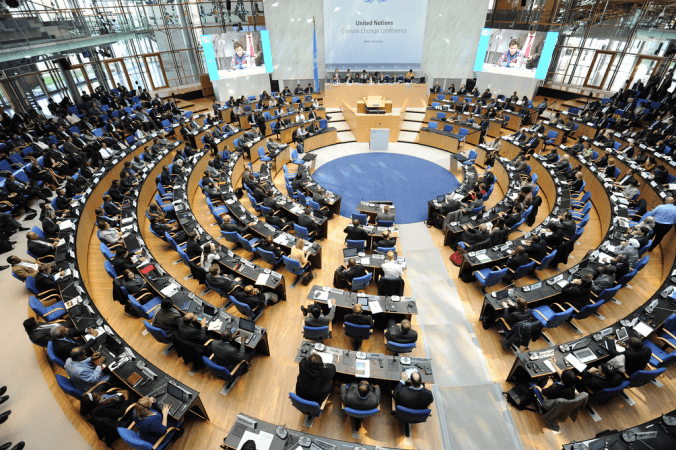 Because the UNFCCC has never been able to agree on rules of procedure, a determined minority of states can block moving forward on an agreement widely supported by the rest of the delegates. In the face of intransigence from Bolivia and a handful of other countries, this is what led the plenary at the 2009 Copenhagen meeting to “take note” of the final accord. The following year, the Mexican hosts at Cancun were able to maneuver around the consensus rule by usefully overlooking objections from a few countries, and the Cancun Accord was adopted by the conference of the parties, essentially a do-over of the same agreement from the year before. Only a handful of countries are responsible for the lion’s share of greenhouse gas emissions. Treating the EU as a unitary actor, four political actors were responsible for 58% of emissions in 2013 (China (28%), the United States (14%), EU28 (10%), and India (7%)) (see slide 8 here). With the top 14 actors, you get close to 75% of global emissions. On mitigation, not all states matter. The question remains how can the climate negotiations focus on what those actors need to do and structure the conversation such that higher ambition is rewarded. Without the developing world, the top emitters might become complacent since they are largely responsible for the problem. Deeply entrenched positions are holding back attempts to negotiate a draft text for the UN climate deal at talks this week in Bonn…As the EU heads into domestic negotiations over its 2030 targets, a statement sent out by a bloc of countries including India, China, Venezuela, Saudi Arabia and Ecuador, said that they were “gravely concerned” that rich countries “no longer seem willing to live up to their commitments”. However these differences are resolved, it is clear that some of the design flaws of the Kyoto Protocol should not be replicated in next year’s agreement. Under Kyoto, emissions reductions commitments for the countries that had them were legally binding. These commitments only covered advanced industrialized countries, and unlike the Montreal Protocol on ozone depletion, there was no graduation procedure for countries to take on commitments as they got richer. All of these are problematic: legally binding commitments may be problematic for reasons I outline below. Any new agreement has to include countries like China, both in terms of the efficacy of the response and the politics of keeping key countries like the United States involved. Finally, states should automatically have to take on commitments as their wealth or emissions use reaches certain thresholds in terms of GDP capita or pollution. Many environmental groups have historically regarded legally binding treaties as the apotheosis of seriousness. However, what this meant is that the United States was never going to be able to ratify because the rule that 2/3 of United States senators provide their advice and consent for treaties is almost uniquely high. That 2/3 rule has meant that the 1982 Law of the Sea Treaty has languished unratified by the United States despite the support of the military, the business establishment, and environmentalists. With 1/3 of U.S. senators implacably opposed to international treaties as an article of faith and fealty to the sovereignty of U.S. domestic law, most controversial treaties have become dead letters. Kyoto was never sent to the Senate by the Clinton administration for precisely this reason. Thus, Todd Stern declared last week that while pieces of the agreement next year could be legally binding, namely the parts that reference reporting and monitoring requirements, other pieces of the proposed agreement should remain as political commitments. Here, he meant that country commitments of emissions reductions should remain as country declarations of intent that might be backed up by domestic law, but they should not be internationally legally binding. Reporting requirements are likely to be less objectionable to the Senate, and if other countries like China can be persuaded to embrace them despite their reservations, the Obama administration is more sanguine that the United States could accede to this part of a legally binding accord. Whether or not the Obama administration would attempt to ratify that piece through the Senate or through alternative means (such as executive action or executive-congressional agreement) as some have proposed in the past remains to be seen. The purpose of this straddle is to keep the U.S. in. Since this problem cannot be addressed without meaningful participation by all the major emitters, continued U.S. absence from participation would be fatal for the 2015 agreement, not least because China won’t enact expensive measures to reduce its own emissions if the U.S. is not a party. In previous conference of parties, countries agreed to contain keep global temperatures from increasing more than 2 degrees Celsius above pre-industrial levels, a threshold deemed by scientists beyond which “dangerous consequences” could occur. My concern as a political scientist is that what governments need are goals that have some plausible and immediate — or at least reasonable — connection to things that they actually do, and if the goals are so far removed from things that they can actually do and actually will do, then the goal really serves no useful strategic purpose. [A] set of indicators is needed to gauge the varied stresses that humans are placing on the climate system and their possible impacts. Doctors call their basket of health indices vital signs. The same approach is needed for the climate. Much of the natural science world has a view of politics that starts with experts setting goals and turning the science crank to compute what governments must do. Much of the social sciences, including political science in particular, sees the process basically in reverse order—with governments determining their interests (often with expert inputs) and then global “solutions” emerging from that decentralized process. My argument, then and now, is don’t double down on things that aren’t working. Typically, such attacks then hang on your head the guilt for any climatic disasters that would follow if governments were to pause and take a breath and think rather than just doubling down. That why, I assume, Charlie and I are now responsible for the populations of sub-sea level cities. Stefan says “nobody in their right mind would aim to warm the climate by 2 degrees C.,” which seems to imply that we are happy to see the planet blow through this goal. This is not only logically erroneous, it ignores the reality that building an effective system of management of the climate is a long-term process. If you make mistakes early on in building the right institutions it is important to fix them because institutions have path dependence. In general, I am persuaded by Victor’s argument here that the 2 degrees target is problematic. As he details in the extended comment on Revkin’s blog, one would have to make some herculean assumptions to imagine that we can meet the 2 degrees target at this point, which would imply perfect and universal implementation starting right away. That doesn’t mean that we should do nothing but that we should focus on a wider set of goals that might in fact be attainable. The temperature target still might be among them, but Victor sees the global average temperature increase as a lagging indicator and sees others such as high latitude temperatures as perhaps more useful. While this may not be as critical a sticking point in the Paris negotiations next year, negotiators would be wise to begin a process of multiple indicator goal-setting so that the Paris negotiations are remembered more favorably than Kyoto. Normative dilemma of writing policy? The argument about legally binding makes sense to me in the US context, especially if there is a robust reporting and monitoring system in place that can ground political accountability and a system of normative expectations. Not sure I buy the argument about 2 degrees though. Yes, as we discussed in the comments section of your other post, short and medium term objectives would be very useful, but in the end 2 degrees provides the benchmark for states who decide that global climate change is not in their interest. Without some sense as to how short and medium term policies are to be structured in a long term context, what do we do? The earths climate has not warmed for at least the last 17 years. “Scientific” climate models have been dreadfully wrong. In other words, the science was lacking. Global warming is a theory. The planet has always had climate change. Climate change occurs in both directions. The degree to which man impacts the climate change is far from clear. It also remains unclear what if anything should be done about it. Environmentalism, while nice, can be just as fanatical as any other extremist group. We live in a world with limited resources. We should be very careful how we spend them. It appears that global warming hysteria is misguided leading to a gross misallocation of precious resources. Seriously? True, global warming is a theory, but in scientific terms that is a statement of limited value. More importantly, we know the mechanism by which anthropomorphic climate change operates. It is basic physics that CO2 inhibits re-emission of infrared radiation. While how precisely that will play out in the complex dynamic of the global climate system is very much science in progress, the basic mechanism means that humans are introducing a substantial change agent into the system. Jeffrey C Isaac is my cousin the famous musician. This is the other Jeffrey Isaac. And yes, humans are adding to the carbon footprint. The debate is what if anything should be done about it. So far, the scientific evidence is weak and misrepresented. Additionally, the scientific models that have failed to accurately predict global warming for the last 17 years cannot model in changes in human behavior and ingenuity regarding new energy sources. To add insult to injury, there are also benefits to global warming that are not part of the discussion. Unfortunately, climate science has become politicalized because the research funding is biased and dishonest. Let’s be sure we get our terms straight here. Global warming is an observation. Denying that the global climate system is warming would be like denying that the moon exists. Anthropogenic global warming is a theory (namely, that the warming of the global climate system is explained in large part by the release of CO2 into atmosphere by human activity), and there are a number of hypotheses that can be derived from the theory (such as how fast temps will rise in different areas, what the effects will be on rainfall patterns, etc). As you note, some of the hypotheses have been wrong, but that does not disprove the theory. In fact, the theory of anthropogenic global warming does a better job of explaining the observed facts than any other theory on offer. Theories about natural cycles of heating and cooling of the Earth cannot account for the speed with which the climate has warmed over the last few hundred years (not just the last 17). Until a viable theoretical alternative emerges, it would be unscientific to abandon the prevailing theoretical model. On two degrees, I’m generally sympathetic to the criticisms of the target, but in my mind the disagreements about the target’s appropriateness/achievability hinge crucially on assumptions about future technological and economic trends, often in 20 or 30 years (e.g., the diffusion of bioenergy carbon capture and storage). From a political point of view, I’d be surprised if governments at the UNFCCC would drop the target explicitly (and embarrassingly for them) as long as there is a chance that things like BECCS will ride in and save the day. On a legally binding treaty, I strongly agree. I don’t see any realistic scenario where a 67-vote coalition can be assembled for a treaty on an issue as polarising as climate change. If the Democrats couldn’t bring conservative members into the fold for a 60-vote cap and trade system, it’s hard to see how they could build a 67-vote coalition for a treaty. Especially not now that the Republicans have a 54 seat majority in the Senate.